I relocated here from Danville (Bay Area) 1978, like many area residents. After stops in Incline Village (Lake Tahoe) and Maui, where I learned about Architecture, and Home Building from my parents, who were savvy R.E. investors in the most beautiful destinations around the world. 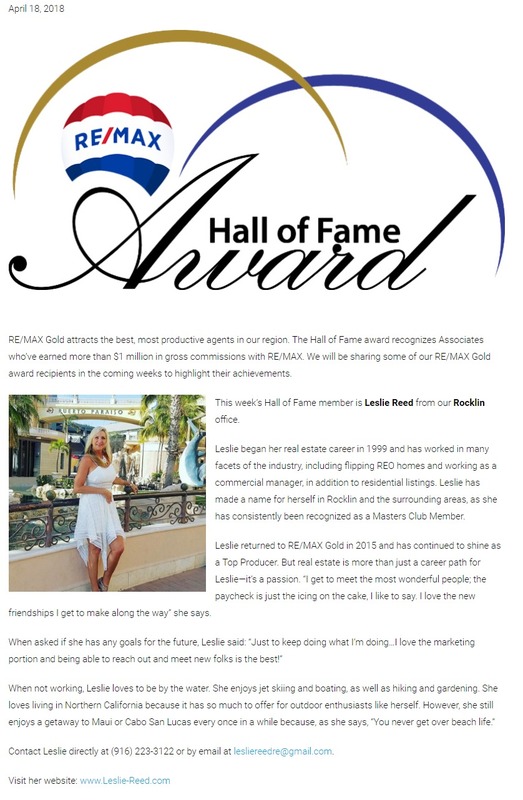 I offer my Clients my vast experience in RE, having Sold over 200 Homes in our area and having over 30 years experience in the Real Estate field. With 17 years in Real Estate Re-Sales and 16 years in Property Management/Commercial Management. I was previously a Regional Manager from Sac to LA Commercial and Multifamily housing. I am an experienced, hard working, dedicated Realtor. My strength is not only presenting my Listings in a way to achieve a Top Sales price, that always sell quickly and for TOP sales price, but also being able to match my Buyers lifestyle with the correct area, then finding it at great price and a solid Investment. I have FLIPPED many Homes from Million Dollar Homes (Loomis) to Fixers for the GOLDEN 1 Credit Union, while representing their Foreclosure Account for almost 4 years. Visit my Website (WWW.LESLIEREEDRE.COM) to view my Letter of Recommendation from this position. If you are searching for an experienced Agent who produces results - look no further. Why trust your largest investment with anything less? Call me today!